If anyone can make red velvet cake, it’s a sweet tea drinkin’ Southerner. Though I call Chapel Hill, NC my hometown, it’s mostly because that’s the place where I’ve lived the longest. My family, however, has no Southern traditions, unless you count eating grits at the Waffle House. Beta Wife on the other hand, is a born and raised North Carolinian, who can use her southern drawl to charm the pants off a snake. On a phone call to the Beta mother unit in NC, BW asked for the “family recipe,” and was directed to Southern Living; it’s the go-to reference for irresistible "country" cooking. 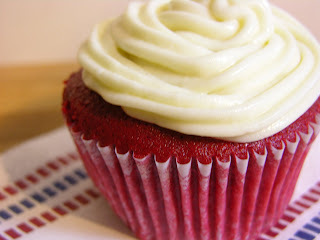 Two bottles of red food coloring later, I was presented with a batch of cupcakes topped with cream cheese frosting. After a few drinks, and a few cupcakes in place of dinner, I couldn’t help but feeling a little, uh…red. That’s the only way I can describe this particular cupcake overdose. I can’t remember how many I ate, but I can tell you it was way too many. Of course that didn’t stop me from having one for breakfast this morning. I still a feel a little red from that one, too. For the baker in your house, this red velvet recipe can be found here: Southern Living, November 1996. 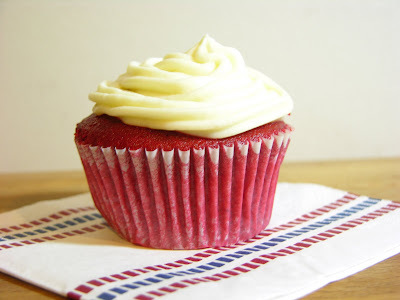 The Wife’s super creamy, cream cheese frosting recipe is below, and I highly recommend it. Blend Neufchâtel with vanilla and sifted powdered sugar to taste. This version makes a creamier, less sweetened frosting that is very rich. *Neufchâtel (American style) makes a tangy, and slightly healthier substitution for cream cheese. It’s good on bagels too.